Greetings from Washington Postcard. Available at Legends’ General Store. Washington – The Evergreen State! The Evergreen State provides a wealth of travel destinations as varied as its topography. From coastal regions, to mountain areas, to desert environments, there’s something here for everyone. Visitors enjoy small towns with unique charm, metropolitan cities with fine dining, dancing, & museums, visiting the Olympic Peninsula, the San Juan Islands, the Washington Coast and the Cascade Mountains for spectacular views. Drive along more than 25 scenic byways through this picturesque state, visit Puget Sound for some of the best fishing and boating in the country, hike at St Helens, Mount Ranier and the Snoqualmie Pass, and ski the high trails of the Cascades. And don’t miss Washington’s exciting history as you follow Lewis and Clark to their final destination, become a part of the Klondike Gold Rush and learn about the Indian lore of the Pacific Northwest. 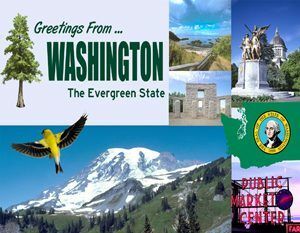 Enjoy your travels in Washington and welcome to the Evergreen State Legends. The Washington state flag and the state seal are similar. Passed in 1923, Washington state law describes the flag as having dark green bunting with a state seal in the center. It is the only state flag that is green. It is also the only state flag with a picture of a president. 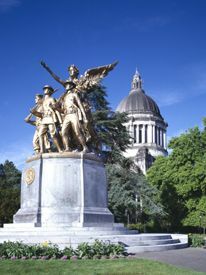 Capitol World War I Statue, Olympia, Washington. Photo by Carol Highsmith. Harbor Island – The Largest Artificial Island in the U.S.
All images available for photo prints and commercial downloads HERE. Kelly, Bill ; Exclusive Clues To John Tornow’s Cache; Lost Treasure magazine; July, 1993. McClary, Daryl C.; Victor Smith forcibly moves the U.S. Customs Port; Online Encyclopedia of Washington State History; September 21, 2005. Morgan, Murray; The Last Wilderness; University of Washington Press; June, 2003. Walker, Goodyear K.; We’ll Find a New Captain…; California Shipwrecks; 1999.